Western Red Cedar is an extremely versatile product that can be used for a range of external applications such as facing cladding or decking. It can also be used for high quality fencing panels and the attached photo shows a bespoke panel manufactured by ourselves to a customer's own specification, prior to delivery to the south east of England. 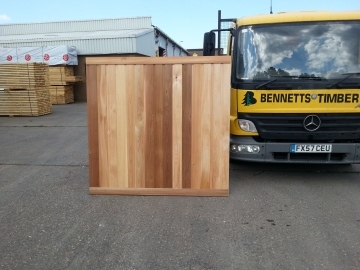 This formed part of a set of panels together with a bespoke gate all made from cedar. The finished product looks great and will be very durable. If you are looking for a bespoke product made from cedar, Siberian Larch or Thermowood, do not hesitate to call our sales team on 01472 350151 to discuss your requirements with them.